Using your personal aesthetic as a guiding principle, we tailor our designs to create a functional solution that will fit seamlessly with your needs and match your unique and personal vision and lifestyle. The design team works with the production team throughout the entire process to ensure that everything will be built to project scope expectations. Your involvement is a key factor in our integrated and collaborative design process since you will ultimately be determining your budget, design priorities, and materials selection; any questions you may have are answered as they arise so you can feel confident in the quality and the progress of your remodel. Communication and collaboration ensures that we are meeting your expectations for scheduling, budget, and quality at every step of the way- a commitment that every member of our team shares to ensure you are highly satisfied with the process and the end result. Remodeling requires specific expertise in both design and construction. It is our job to ensure your new space is everything you had hoped it would be in the design phase. During the construction process, your assigned construction Project Manager will have an in-person meeting with you weekly at a regularly scheduled time in your home. During this meeting, we encourage open communication regarding your project and provide space to discuss any issues that may have emerged during this stage of your remodel. We recognize that your home will be disrupted during the construction process; with decades of expertise under our belts, you can be confident that we will remodel your home with detailed care and respect for your living environment. Our talented, local crews are chosen for their demonstrated regard for your privacy and property. Carrying the appropriate licenses, workers’ compensation insurance and general liability insurance for their trade, you will find them to be conscientious and just as dedicated to your project as you are. After construction is complete, we will leave you with a remodel that fulfills your functional needs and is a beautiful statement of your personal style, giving you peace of mind when choosing us to take care of your home. We can’t say enough positive things about Naples Build to fully describe how pleased we are with the design and build work they have completed in updating our home. Our home looks beautiful, feels more spacious and includes expanded, aesthetically-pleasing storage and greatly improved energy efficiency. 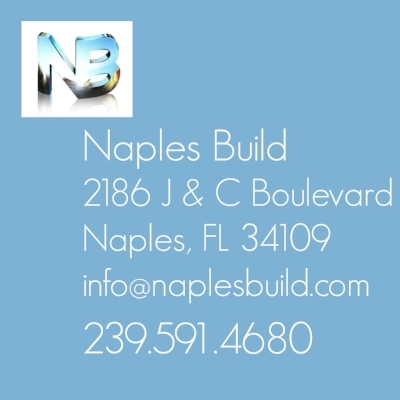 All members of the Naples Build team were a pleasure to work with, very professional and expert in each of their fields, they were also very flexible and patient. All the work was completed on time and within budget. We recommend Naples Build without reservation. We will miss spending time with them and look forward to having another job with them sometime in the future!